As the sun began to set on Monday, the second day of Ramadan, Ramallah seemed to have recovered a degree of calm. After a military crackdown and two weeks of insecurity that followed the disappearance of three teenage settlers, families were preparing for Iftar meals and looking forward to the evening’s Algeria World Cup appearance. Once the grim news broke that the teenagers' bodies had been found, however, the mood in the city quickly shifted to terrified anticipation. The weeks-long Israeli army operation had already seen more than 2,100 Palestinian-owned buildings searched, at least 566 Palestinians arrested and six Palestinians killed, and all before the bodies were found in a shallow grave near Hebron. Anxiously scrolling through updates on Facebook and Twitter, people braced themselves for the worst. Speculation about what form the Israeli retaliation would take – a Gaza invasion, settler attacks, further raids and deaths – only further flared up anxieties. But there was little else to do, as announcement after announcement filtered in from Israeli politicians openly vowing revenge. “This tragic ending must also be the ending of Hamas... [W]e have to destroy the homes of Hamas activists, wipe out their arsenals everywhere, and stop the flow of money that directly or indirectly keeps terror alive,” Haaretz reported Deputy Defence Minister Danny Danon as saying. Every such statement only worked to assure the Palestinians that they could do nothing but wait for whatever violence was about to commence. “Usually after breaking the Ramadan fast, everyone is on the street, shopping and meeting and talking," Shireen, who lives in al-Eizariya less than 10km east of Jerusalem in the West Bank told Middle East Eye. “But last night, and tonight, we are too afraid to leave our houses. We stay inside. The street is empty, as if it is the very first thing in the morning." “When we heard the news, the first thing we did was to take my husband and brother inside. They have not done anything, but we were afraid the Israelis would take them,” adds Shireen, who also says she fears how the reprisal will impact her two-year-old son. But while most parts of the Occupied Territories are gritting their teeth in anticipation, Hebron residents, which have borne the brunt of the Israeli reprisal in recent weeks, don’t even have time for anxiety. 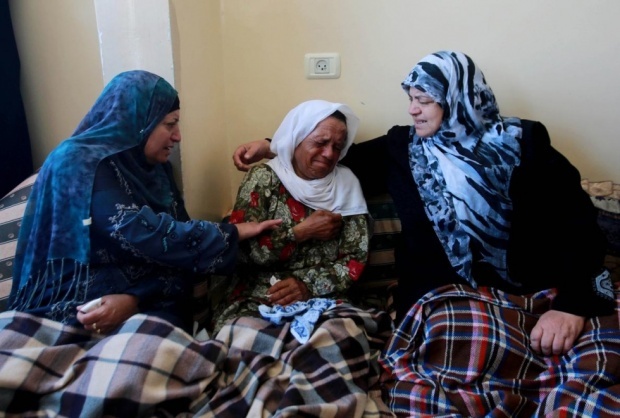 Hisham Sharabati, a human rights fieldworker, told Middle East Eye that Israeli troops arrived almost immediately at the homes of the suspects in the teenagers' murder, and their families. “They smashed everything in the house – the sinks, toilet everything. It was horrifying: the only people there are women and children, as the men in the area had been arrested. I saw they had prepared the iftar meal (for breaking the Ramadan fast) and they had not been able to eat it,” says Sharabati. After the evening raids, a sense of unease continued to hang heavily in the West Bank streets. Sharabati says that in Hebron today he witnessed soldiers raiding a stationery store, as road blocks remained in place and normal life all but ground to a halt. “People are expecting the worst. They are very afraid, both of violence from settlers, and from military violence. We have no protection from this,” Sharabati explains. Throughout the West Bank, there has been a feeling that the response to the teenagers’ deaths is a deeply unjust collective punishment, doled out to all, irrespective of complicity or guilt. There is also a sense of resigned observation that this is just another development in what is now an everyday reality. All around there is talk not just of Israeli invasions during the first and second Intifada, but of Palestinian prisoners in Israeli jails and the children killed by Israeli forces. All of these dominate conversation as the fear about what turn the reprisal will take next continues. “No-one likes it when civilians get hurt, or something bad happens to them, whether they’re Israeli or Arab,” Imad, 47, told Middle East Eye from his small shop in Qadura refugee camp in Ramallah. “But these families, and this government, feel now how we feel. Thousands of Palestinians are captured and killed, and they are civilians too. “We’re against this kidnap idea. But this is happening to us every day,” he adds. Mustafa Barghouti, a member of the Palestinian National Initiative Party, has been explicit in his analysis of the settlers’ deaths, and the Israeli response, in terms of a wider Israeli strategy. Netanyahu, Barghouti believes, is seeking to “mobilise the tragic death of these people for his own purposes.” He says those aims are threefold: to destroy Palestinian unity, break Palestinian resistance, and to end the international isolation of Israel. “What Netanyahu does have is one goal - to destroy the creation of the Palestinian state,” Barghouti adds. Most Palestinians agree that there is a much deeper Israeli strategy behind what has happened over the last few weeks. Husam Zomlot, a Palestinian official who has served as PLO representative to the UK and deputy to chief negotiator Nabil Shaath, says that Brother’s Keeper - the operation launched following the teenagers’ disappearance - was a political strike against the Palestinian government. In Qadura refugee camp, Imad’s son Ahmad, 21, also voiced cynicism. Like so many others, however, his father said that the consequences concerned him more than whatever may have caused the recent upheaval. As another evening approaches, bringing with it the prospect of yet more evening raids and bombs, people have retreated to their homes once more in anticipation of what may yet be to come. Two young Palestinian men were hit by rubber-coated steel bullets to the neck fired at them by Israeli officers during clashes in the squares ofthe al-Aqsa Mosque compound. 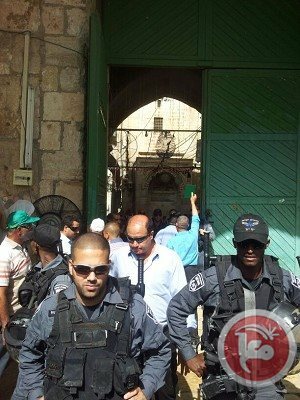 A Ma’an reporter said Israeli forces imposed heavy restrictions on the main gates of the compound allowing only very few worshipers to access it after leaving their ID cards at Israeli checkpoints. Meanwhile, Israeli rightists were allowed to enter the compound via the Moroccan Gate heavily escorted by police officers and soldiers. Witnesses said the “unwanted” visitors verbally assaulted Muslim worshipers who responded with stones thrown at the settlers. Israeli special forces deployed in the compound and surrounded worshipers who were inside the al-Aqsa mosque firing rubber-coated bullets at them. As a result, a young man was hit by a rubber-coated bullet to the neck. Dr Ziad Srour, who works in a medical center inside the compound, said two young men received first aid after they were hurt during clashes with Israeli forces. One was hit in the front of his neck and the other was hit in the back of his neck. Separately, Israeli police detained a 12-year-old boy from the squares of al-Aqsa. He was taken to Qishla police station near Jaffa Gate. Deputy chairman of Hamas's political bureau and former Prime Minister Ismail Haneyya said, "Israeli threats to Gaza Strip and Hamas Movement do not scare us, and we will respond to any Israeli attack on the Palestinian people." Commenting on Israeli accusations to Hamas over the kidnapping and killing of the three settlers in al-Khalil, Haneyya told Anadolu News Agency on Monday night that Israeli threats do not scare the Palestinians who will respond to such threats with strong determination and steadfastness. Following confirmed news saying that the three missing Israeli settlers have been found dead in the West Bank, Israeli Prime Minister Benjamin Netanyahu held Hamas Movement responsible for their death, vowing that "Hamas will pay the price." Speaking at the start of a security cabinet meeting late on Monday, Netanyahu said "Hamas is responsible for their killing, and it will pay the price." Along the same line, Haneyya said that Israeli repressive policy including raids, killing of Palestinian youths, arrests of PLC members, and burning agricultural lands, will not succeed in breaking the Palestinian will and determination. Israeli military sources confirmed on Monday that the three Israeli settlers who went missing earlier last month in the West Bank have been found dead. The Israeli cabinet is scheduled to meet on Tuesday to discuss what Israel's response should be to the killing of the three settlers who have been found dead on Monday in Halhul town in al-Khalil. “Hamas is responsible and Hamas will pay dearly”, Netanyahu said at the opening of an emergency security cabinet meeting called after the bodies of the three settlers were found. 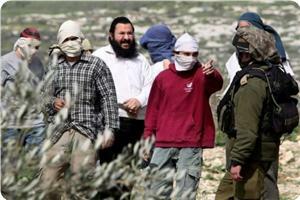 Israeli military sources said that the three settlers were shot dead soon after being kidnapped. During the cabinet meeting, an Israeli minister said the objective is to avoid escalation and act responsibly, while most of the ministers called for stronger response. Economy Minister Naftali Bennett said that the response to the abduction was weak and disgraceful, saying a much stronger response was required. Additionally, Palestinian security sources reported that groups of settlers were throwing stones in the Gush Etzion settlement area to Palestinian vehicles, causing considerable damage to them. Bodies found The latest Israeli violence followed the discovery of the bodies of the three youths near the occupied West Bank city of Hebron on Monday. Calls for revenge Israeli Prime Minister Benjamin Netanyahu led the pack, calling the killers of the youths “human animals” and stating “Hamas is responsible. 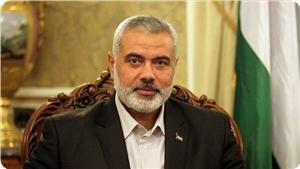 Hamas will pay.” Netanyahu specifically used the word “revenge” hinting at what he may have in store. But many went even further. Incitement on social media From the moment news broke that the Israeli youths’ bodies were found, Israeli social media, including Twitter and the Facebook pages of major Israeli media outlets such as Walla! News, were quickly filled with pervasive and lurid calls for bloodshed that have become all too familiar. Four Palestinians were injured as dozens of Israeli airstrikes rocked Gaza overnight, a Palestinian official said Tuesday. Ashraf al-Qidra, a spokesman for the Palestinian health ministry, said that four workers sustained moderate to serious injuries as airstrikes hit evacuated Israeli settlements. The four were taken to Nasser Hospital in Khan Younis, al-Qidra said. South of Khan Younis, airstrikes hit a military training site belong to Hamas' al-Qassam Brigades, witnesses said. Locals said that 13 airstrikes hit the outskirts of Rafah in the southern Gaza Strip, targeting sites belonging to the military wings of Hamas, Islamic Jihad, and the Popular Resistance Committees. 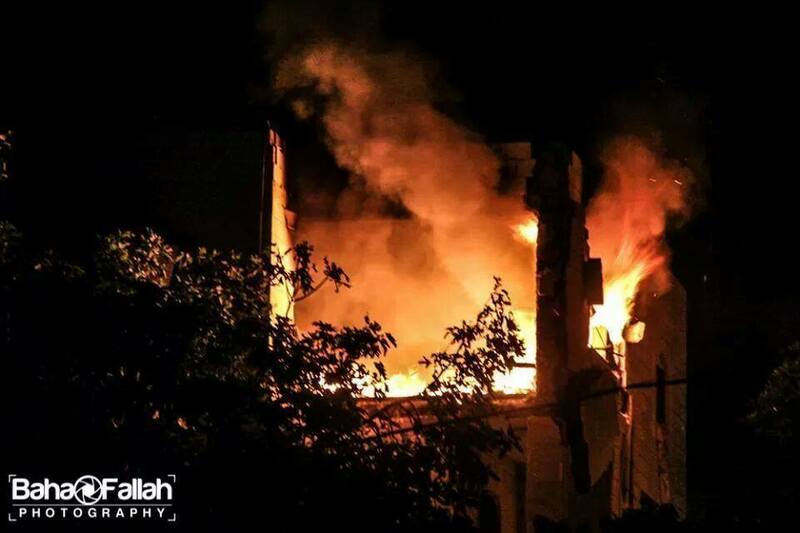 More airstrikes were fired at an al-Qassam site in Beit Lahiya in the northern Gaza Strip, causing damage. A statement from the Israeli army said "aircraft carried out a precision strike against 34 targets in the Gaza Strip." Strikes were carried out "following over 18 rockets which were fired (from Gaza) at Israel since Sunday evening," the statement said. 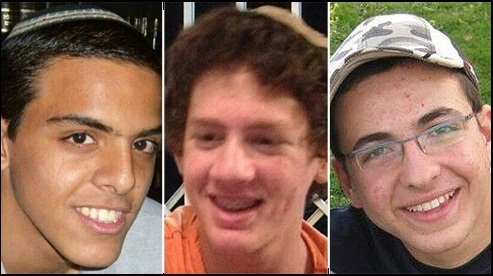 Israeli forces in the West Bank had earlier Monday evening found the bodies believed to be those of three Israeli teens who went missing on on June 12. Israel has vowed to make Hamas pay after three kidnapped Israeli teenagers were found dead Monday, but the Islamist movement warned any attack would open "the gates of hell." Israeli Prime Minister Benjamin Netanyahu announced Monday evening the discovery of the three bodies in a field in the southern West Bank. "They were kidnapped and murdered in cold blood by human animals," he said. "Hamas is responsible and Hamas will pay." The discovery of the boys' bodies -- one 19-year-old and two aged 16 -- came 17 days after they disappeared, triggering a huge manhunt during which five Palestinians were killed and more than 400 arrested. Two Hebron Hamas men named by Israel as prime suspects -- Marwan Qawasmeh and Amer Abu Eisha -- are not in Israeli custody and have not been tried or convicted but Palestinian witnesses said troops blew up their homes early Tuesday. The Israeli roundup -- mainly of people linked to Hamas -- brought a wave of rocket attacks against southern Israel by militants in the Gaza Strip, answered in turn by Israeli air strikes. The latest round began around 1:00 am Tuesday when a rocket landed in an open area the Negev desert region, with no injuries or damage reported. Shortly afterwards the Palestinian interior ministry reported around 30 Israeli air strikes on deserted militant training sites across Gaza, injuring four people. Ashraf al-Qidra, a spokesman for the Palestinian health ministry, said four workers sustained moderate to serious wounds when airstrikes hit evacuated Israeli settlements. The four were hospitalized at Nasser Hospital in Khan Younis. Medics named the dead youth as Yousef Abu Zagha, 16. 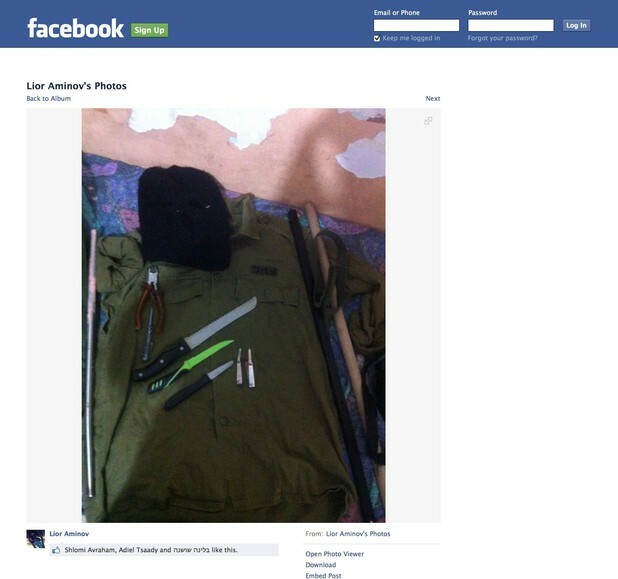 An Israeli military spokeswoman said that he was a "Hamas operative" about to hurl an explosive device at troops sent to arrest him. "They opened fire and confirmed a hit," she said. The Israeli youngsters' bodies were found near the West Bank town of Halhul, some 10 minutes drive from the roadside where they were last seen hitchhiking. US President Barack Obama condemned the killings and warned against actions that could further "destabilize" the situation, amid the threats of retaliation against Hamas. British Prime Minister David Cameron slammed an "inexcusable act of terror" and pledged to stand with Israel as it seeks justice. French President Francois Hollande denounced the "cowardly murder" of the teens which German Chancellor Angela Merkel called "a detestable act for which there is no excuse." Hamas has dismissed the Israeli allegations as "stupid" with Abu Zuhri accusing Israel of fabricating the kidnapping as an excuse to crack down on the movement. "The occupation is trying to use this story to justify its extensive war against our people, against resistance and against Hamas," he charged. President Mahmoud Abbas has come under massive Israeli pressure to renounce a reconciliation agreement with Hamas under which a merged administration for the West Bank and Gaza was formed in early June for the first time in seven years. Israeli forces shot and killed a Palestinian teenager during a military operation in Jenin refugee camp in the northern West Bank early Tuesday, locals and medics said. Palestinian Red Crescent medics told Ma'an 16-year-old Yousef Abu Zagha was shot by Israeli fire in the chest during clashes with troops who raided the camp overnight. 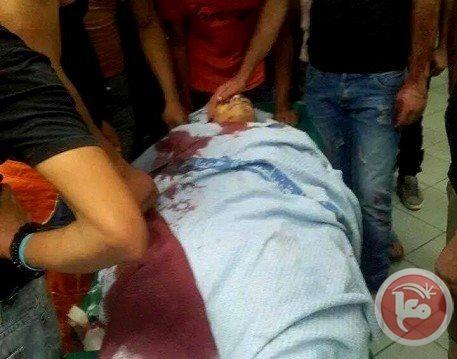 Abu Zagha was pronounced dead shortly after arriving at a public hospital in Jenin. "They opened fire and confirmed a hit," the spokeswoman said. The killing came after Israeli forces found the bodies of three Israeli teenagers who had been missing in the West Bank for over two weeks. Israeli forces have killed six Palestinians in the military operation that followed the disappearance of the teenagers from the Gush Etzion settlement on June 12. The Israeli Air Force has escalated its aggression against the Palestinian people in the besieged Gaza Strip, and conducted dozens of air strikes targeting different areas in the coastal enclave. The attacks led to massive property damage, while various areas in the Gaza Strip lost power after electricity poles and power generators were hit in the attacks. 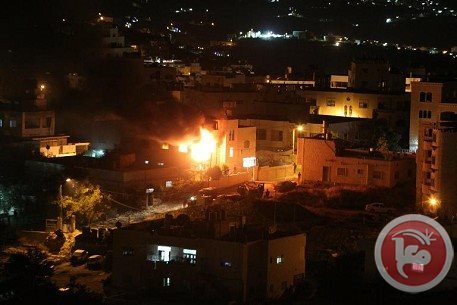 The Palestinian News & Info Agency (WAFA) has reported that dozens of explosions were heard, especially in agricultural and open areas, in different parts of the coastal region. It stated that Rafah, Khan Younis, the Central District, and northern Gaza have been targeted in more than 30 attacks carried out by the Israeli Air Force and Israeli navy ships. Although some of the bombarded areas are training centers for armed resistance groups in Gaza, many civilian homes, property and structures were hit. Maan News said that the army also bombarded a resistance center for the al-Qassam Brigades, the armed wing of Hamas, west of Khan Younis. Maan added that the army carried out at least 13 air strikes, targeting resistance camps belonging to the al-Qassam Brigades, the al-Quds Brigades of the Islamic Jihad, and Salah Ed-Deen Brigades, the armed wing of the Popular Resistance Committees, in different parts of the Rafah district. The army also shelled open areas and vacant resistance camps in northern Gaza, including a center for the al-Qassam Brigades in Beit Lahia. 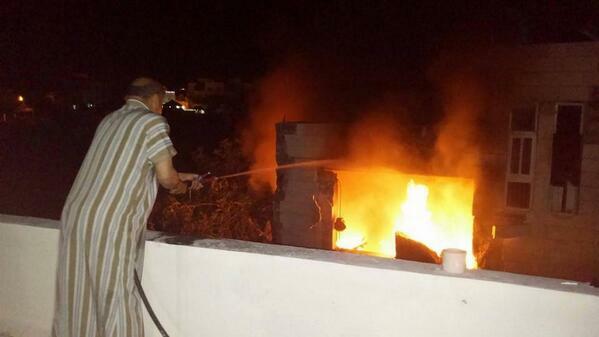 The Israeli attacks caused excessive property damage to several buildings and structures, including a number of homes. Spokesperson of the Ministry Of Health in Gaza, Ashraf al-Qodra, said the Israeli attacks caused no human casualties, and called on Palestinians to remain alert, as the army will likely carry out further strikes. 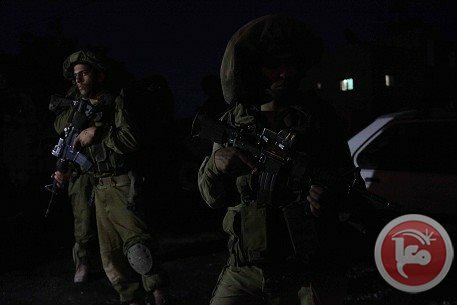 On Monday at dawn, dozens of Israeli military vehicles continued the extensive military operations, and home invasions, into the southern West Bank district of Hebron, broke into and violently searched dozens of homes, and kidnaped one Palestinian. Another Palestinian kidnapped near Ramallah. Local sources in Hebron have reported that dozens of soldiers invaded the home of Marwan al-Qawasma, allegedly behind the disappearance of the three missing Israeli settlers, and searched it for more than two hours, causing excessive property damage, and confiscated the family’s car. The soldiers also invaded and searched dozens of homes in different parts of Hebron city, causing property damage, and interrogated several families. At least 40 military vehicles invaded Ein Sarah neighborhood, in Hebron, surrounded the al-Hussein Ben Ali Mosque, broke into a local print shop and several homes, and violently searched them. The soldiers also kidnapped a young Palestinian man from his home, in the Habayel Riyah area in Hebron, and ransacked his property. 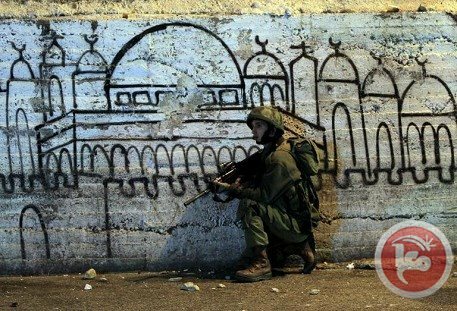 Another invasion took place in Bab az-Zaweya area, in Hebron, where the soldiers invaded several homes that belong to members of the al-Qawasma family, and searched them. In Halhoul nearby town, soldiers search a number of areas, especially west of the town, and fired dozens of rounds of live ammunition. The army also invaded Doura town, installed a roadblock on the main road between Doura and a number of villages, and searched dozens of cars while investigating the ID cards of the passengers. Soldiers also invaded the town, and fired several gas bombs and concussion grenades, some of them directly hitting homes causing several Palestinians to suffer the effects of tear gas inhalation. Furthermore, at least three military vehicles invaded Deir Samet village, and conducted military searches of homes and property. In related news, soldiers invaded Betunia, west of the central West Bank city of Ramallah, and kidnapped one Palestinian identified as Anas Qert, after searching his home. Soldiers also invaded several homes in the area, and installed roadblocks. Local youths hurled stones at the invading soldiers who fired gas bombs, concussion grenades, and rubber-coated metal bullets. During the government weekly meeting Sunday, Israeli Prime Minister Benjamin Netanyahu stated that Israel is ready, and willing, to expand its operations against the Hamas movement, adding that the shelling of different areas in Gaza is just part of limited operations that could be expanded at any given moment, if needed. Israeli Foreign Minister Avigdor Lieberman said Israel should “reoccupy Gaza”, and crush Hamas, and other armed groups in Gaza. Violent clashes broke out at dawn Monday between the Israeli occupation patrols and unarmed Palestinian youths at an abrupt military checkpoint set at the western entrance to Dura, south of al-Khalil, in the Occupied West Bank. 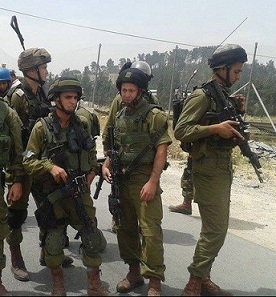 Meanwhile, the Israeli occupation forces (IOF) conducted a search operation in Halhoul town in al-Khalil. According to local sources, a military checkpoint was erected by the IOF on the main road between Dura and a number of western villages. 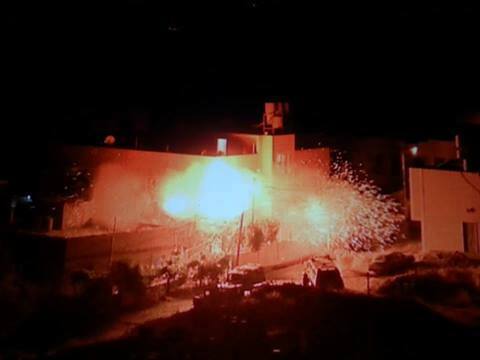 The Israeli occupation army targeted Palestinians’ homes and neighborhoods with tear gas canisters and acoustic bombs. Scores of Palestinian civilians were treated for breathing problems after they inhaled tear gas. In a related event, sources in Halhoul town said a large Israeli military force scoured Arnaba area, to the west. Heavy firing of live ammunition was detected all along the campaign. Such a wave of Israeli raid campaigns has been going on for a long while under pretext that three Israeli soldiers have been missing since June 12.